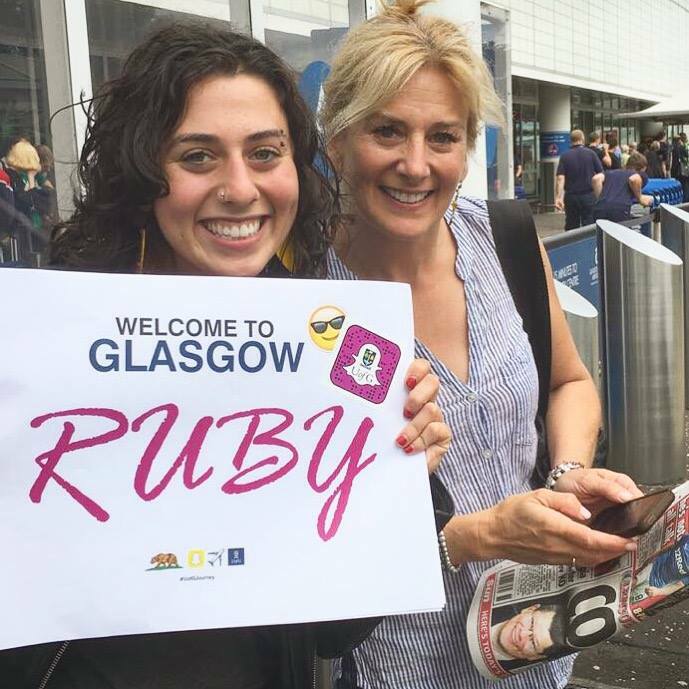 Incoming student Ruby Elson recently took part in the University of Glasgow’s Snapchat Takeover, and documented her journey from California to Glasgow, via France. Here she shares her thoughts on becoming a Glasgow fresher. My name is Ruby Elson, and you might recognize my face if you follow the UofG snapchat. I began writing this on a train from Paris to Rennes, Brittany. It was there that I lived for my sophomore year of high school. As I passed by the French countryside, I was hit with a wave of amazement. I still can’t believe that I’m starting my undergraduate degree at the University of Glasgow! Now before you ask, allow me to answer your question. I chose Glasgow, not just because it was far away from California, but because I’m studying political science and I’d like to gain a different perspective from that of the USA, especially with the political climate in the UK right now. I’m eager to learn from a well-respected university. Well, I’d be eager to learn even if I was going to a college with a shoddy reputation! I first heard of the University of Glasgow through the Common App (It’s like the UCAS for Americans). The more I explored, the more interested and motivated I became. I ended up busting my booty to do everything I could to secure a place there. I contacted the lovely Leann Schmitz, who was incredible with helping me through the entire process. It was through her that I eventually got the opportunity to be a part of the Snapchat Takeover. In a joint effort between the Marketing Office and the Communications Office, the Snapchat Takeover was born. The idea behind it was to encourage folks everywhere to come out to the University of Glasgow, regardless of distance. By watching someone do it first, via Snapchat, it’d be easier for others to do the same. Being a part of this experience was some of the most school-related fun I have ever had–Although I have yet to experience Fresher’s Week! What this project entailed was simply snapchatting who I was, what my life was like, and my journey from California to Scotland, with a brief pitstop in France. It was super fun and easy to do, but to be honest I was a bit overwhelmed at how many people saw each snapchat. To give you some perspective, on my personal snapchat, a lot of views for me is around 85 views. Dan, the wonderful Senior Social Media Officer, uploaded a video of me to Facebook that got around 8,743 views. The discomfort was only momentary, as I love the spotlight. I was the biggest theatre nerd in high school, and I’m still a bit of a thespian. But come on, who wouldn’t like positive and wanted attention? In fact, it’s very possible that I’ll continue blogging or something along those lines. I loved being a part of the UofG snapchat, and getting to meet so many spectacular people! This has truly been Fun, with a capital F! But I’m even more excited to become a part of this university, and I intend on being an active part of this school. Keep a lookout for me and you just might see me around! Feel free to come say hey, and remember, SMASH THE PATRIARCHY!